A bioreactor may refers to any manufactured device or system that supports a biologically active environment. In one case, a bioreactor is a vessel in which a chemical process is carried out which involves organisms or biochemically active substances derived from such organisms. This process can either be aerobic or anaerobic. These bioreactors are commonly cylindrical, ranging in size from litres to cubic metres, and are often made of stainless steel. It may also refer to a device or system designed to grow cells or tissues in the context of cell culture. These devices are being developed for use in tissue engineering or biochemical engineering. On the basis of mode of operation, a bioreactor may be classified as batch, fed batch or continuous (e.g. 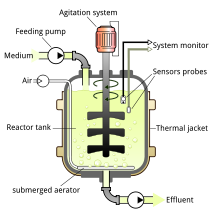 a continuous stirred-tank reactor model). An example of a continuous bioreactor is the chemostat. Organisms growing in bioreactors may be submerged in liquid medium or may be attached to the surface of a solid medium. Submerged cultures may be suspended or immobilized. Suspension bioreactors can use a wider variety of organisms, since special attachment surfaces are not needed, and can operate at much larger scale than immobilized cultures. However, in a continuously operated process the organisms will be removed from the reactor with the effluent. Immobilization is a general term describing a wide variety of cell or particle attachment or entrapment. It can be applied to basically all types of biocatalysis including enzymes, cellular organelles, animal and plant cells. Immobilization is useful for continuously operated processes, since the organisms will not be removed with the reactor effluent, but is limited in scale because the microbes are only present on the surfaces of the vessel. Bioreactor design is a relatively complex engineering task, which is studied in the discipline of biochemical engineering. Under optimum conditions, the microorganisms or cells are able to perform their desired function with limited production of impurities. The environmental conditions inside the bioreactor, such as temperature, nutrient concentrations, pH, and dissolved gases (especially oxygen for aerobic fermentations) affect the growth and productivity of the organisms. The temperature of the fermentation medium is maintained by a cooling jacket, coils, or both. Particularly exothermic fermentations may require the use of external heat exchangers. Nutrients may be continuously added to the fermenter, as in a fed-batch system, or may be charged into the reactor at the beginning of fermentation. The pH of the medium is measured and adjusted with small amounts of acid or base, depending upon the fermentation. For aerobic (and some anaerobic) fermentations, reactant gases (especially oxygen) must be added to the fermentation. Since oxygen is relatively insoluble in water (the basis of nearly all fermentation media), air (or purified oxygen) must be added continuously. The action of the rising bubbles helps mix the fermentation medium and also "strips" out waste gases, such as carbon dioxide. In practice, bioreactors are often pressurized; this increases the solubility of oxygen in water. In an aerobic process, optimal oxygen transfer is sometimes the rate limiting step. Oxygen is poorly soluble in water—even less in warm fermentation broths—and is relatively scarce in air (20.95%). Oxygen transfer is usually helped by agitation, which is also needed to mix nutrients and to keep the fermentation homogeneous. Gas dispersing agitators are used to break up air bubbles and circulate them throughout the vessel. Fouling can harm the overall efficiency of the bioreactor, especially the heat exchangers. To avoid it, the bioreactor must be easily cleaned. Interior surfaces are typically made of stainless steel for easy cleaning and sanitation. Typically bioreactors are cleaned between batches, or are designed to reduce fouling as much as possible when operated continuously. Heat transfer is an important part of bioreactor design; small vessels can be cooled with a cooling jacket, but larger vessels may require coils or an external heat exchanger. A photobioreactor (PBR) is a bioreactor which incorporates some type of light source (that may be natural sunlight or artificial illumination). Virtually any translucent container could be called a PBR, however the term is more commonly used to define a closed system, as opposed to an open tank or pond. Photobioreactors are used to grow small phototrophic organisms such as cyanobacteria, algae, or moss plants. These organisms use light through photosynthesis as their energy source and do not require sugars or lipids as energy source. Consequently, risk of contamination with other organisms like bacteria or fungi is lower in photobioreactors when compared to bioreactors for heterotroph organisms. Conventional sewage treatment utilises bioreactors to undertake the main purification processes. In some of these systems, a chemically inert medium with very high surface area is provided as a substrate for the growth of biological film. Separation of excess biological film takes place in settling tanks or cyclones. In other systems aerators supply oxygen to the sewage and biota to create activated sludge in which the biological component is freely mixed in the liquor in "flocs". In these processes, the liquid's Biochemical Oxygen Demand (BOD) is reduced sufficiently to render the contaminated water fit for reuse. The biosolids can be collected for further processing, or dried and used as fertilizer. An extremely simple version of a sewage bioreactor is a septic tank whereby the sewage is left in situ, with or without additional media to house bacteria. In this instance, the biosludge itself is the primary host for the bacteria. A bioreactor used to ferment ethanol from corncob waste being loaded with yeast. In bioreactors in which the goal is to grow cells or tissues for experimental or therapeutic purposes, the design is significantly different from industrial bioreactors. Many cells and tissues, especially mammalian ones, must have a surface or other structural support in order to grow, and agitated environments are often destructive to these cell types and tissues. Higher organisms, being auxotrophic, also require highly specialized growth media. Mathematical models act as an important tool in various bio-reactor applications including wastewater treatment. These models are useful for planning efficient process control strategies and predicting the future plant performance. Moreover, these models are beneficial in education and research areas. Bioreactors are generally used in those industries which are concerned with food, beverages and pharmaceuticals. The emergence of Biochemical engineering is of recent origin. Processing of biological materials using biological agents such as cells, enzymes or antibodies are the major pillars of biochemical engineering. Applications of biochemical engineering cover major fields of civilization such as agriculture, food and healthcare, resource recovery and fine chemicals. Till now, the industries associated with biotechnology have been lagged behind other industries in implementing control over the process and optimization strategies. A main drawback in biotechnological process control is the problem to measure key physical and biochemical parameters. A bioprocess is composed mainly of three stages — upstream processing, bioreaction, and downstream processing — to convert raw material to finished product. The raw material can be of biological or non-biological origin. It is first converted to more suitable form for processing. This is done in upstream processing step which involves chemical hydrolysis, preparation of liquid medium, separation of particulate, air purification and many other preparatory operations. After upstream processing step, the resulting feed is transferred to one or more Bioreaction stages. The Biochemical reactors or bioreactors form the base of the Bioreaction step. This step is mainly consists of three operations namely, production of biomass, metabolize biosynthesis and biotransformation. Finally, the material produced in the bioreactor must be further processed in the downstream section to convert it into more useful form. The downstream process is mainly consists of physical separation operations which includes, solid liquid separation, adsorption, liquid-liquid extraction, distillation, drying etc. Agitator – used for the mixing of the contents of the reactor which keeps the “cells” in the perfect homogenous condition for better transport of nutrients and oxygen to the desired product(s). Baffle – used to break the vortex formation in the vessel, which is usually highly undesirable as it changes the center of gravity of the system and consumes additional power. Sparger – In aerobic cultivation process, the purpose of the sparger is to supply adequate oxygen to the growing cells. Jacket – The jacket provides the annular area for circulation of constant temperature of water which keeps the temperature of the bioreactor at a constant value. This page is a candidate to be copied to Wikiversity using the Import process. If the page can be re-written into an encyclopedic article, please do so and remove this message. Before you move this content to Wikiversity, verify that it conforms to Wikiversity policies of acceptable content at What is Wikiversity? Often content unacceptable to Wikipedia may not be acceptable on Wikiversity either; facilitate the copying of this article by listing it on Wikiversity:Requests for Import. The reactor contents are perfectly mixed together. The reactor is operating at a constant temperature (i.e., it is isothermal). The feed should be clean and pure (i.e., no biomass in the feed stream). The feed stream and reactor contents have equal and constant density (ρ). The feed and product streams have the same flow rate (F). Equation(1) states that the reactor volume (V) is constant since dV/dt = 0.
where r2 is the rate of substrate consumption. The reaction kinetics involved in biochemical operations is comparatively difficult to obtain than the chemical reaction kinetics. In biochemical operations, the cell kinetics is used for the unstructured models where balanced growth condition is assumed. where μ is the specific growth rate or specific growth rate coefficient(s−1). Here, μ is analogous to first order rate constant k but however, μ is not a constant. Thus,Equations (15) and (16) are the basic equations which are used for the modelling of any bioreactor. Wikimedia Commons has media related to Bioreactors. ^ Lopez A, Lazaro N, Marques AM. The interphase technique: a simple method of cell immobilization in gel-beads. J Microbiol Methods, 1997, 30:231-234. ^ Peinado PA, Moreno JJ, Villaba JM, Gonzalez-Reyes JA, Ortega JM, Mauricio JC. A new immobilization method and their applications. Enzyme Microb Tech, 2006, 40:79-84. ^ Jana, AMIYA K. (2011). CHEMICAL PROCESS MODELLING AND COMPUTER SIMULATION. PHI Learning Pvt. Ltd. This page was last edited on 17 April 2019, at 15:59 (UTC).